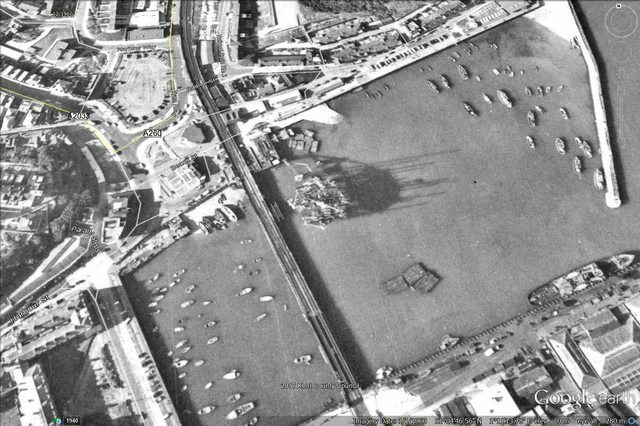 Whilst looking at google earth with regards to Commander Chuffs post about Folkestone Harbour and his amazing model bridge, I spotted this on the 1960 aerial photo. I've centred it in the screen shot. It's a construction site of some sort, the shadow it's throwing to the right makes it look like some sort of platform, an oil rig or similar maybe, there seems to be at least one tower crane on it. Anyone got any ideas? Check these pics from GE of the pier and the building near the end. I would think this is the one you were talking about, note the roof seems to be corrugated to some degree. That must be the listed building my mate mentioned Paola. I've been long gone from the railways but I can still remember unloading MLV luggage vans at the Calais End of a boat train in a S.W. storm at F.H. station. Waves crashing over the train made things very interesting! Went down this afternoon, no problem with access, as long as you go past the café. Looking at the Britain from above website this wall, about 30 metres from the end of the pier, appears to be the rear of a shed constructed between 1920 and 1933. 1946 view on the site gives a later alteration. Thus the wall originally had castellation for ventilation of the engine shed. The infill would be probably to deter anybody from walking on the roof. The outlets, as JW suggests, to provide drainage for seawater. Waves break right over in storm conditions. Presumably the Harbour Master's House is listed, everything else vis being razed to the ground. Hi-vis Man tells me that the pier will be cleared up and open to the public. A Press release is due shortly. Where in the harbour are these please? I'll take a look next time I'm there. Apart from one pillbox, there's nothing showing on the EDoB Database GE overlay in Folkestone Harbour. Cliveh, to get there you need to walk up to the footbridge and up the stairs to get onto the harbour wall. I think it is closed normally as there is a padlocked gate where the steps are, I got up there because there were people fishing from the wall. This may be a stupid answer but I'll give it a try. Were they castellations which have been blocked up later. Castellations would provide cover for any close encounters i.e. invasion. I don't know what they were for either but as this is a F.H. thread, is the area around the pier being cleared? Seen from trains on the Foord Viaduct it, looks like it is. My old workmate said there's a listed building close to the Harbour Station. Are they perhaps to allow seawater to drain back out after waves break over? What were these used for at Folkestone Harbour? Are they remains of some sort of lookout post? I took this photo today.